A perfect Winter's day: crisp snow underfoot and a soaring blue sky overhead. 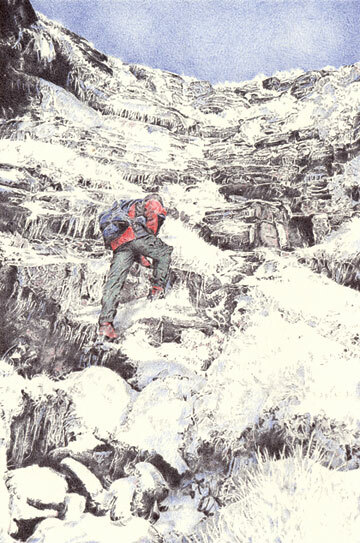 Rod has used only his Caran d'Ache Ecridor Retro ballpoint with Caran d'Ache black, blue, red and green inks to create this scene of a ascent of Kinder Downfall's frozen cascade. The original artwork is now available mounted in a beautiful frame, and also as a handmade fine art card. The cards are blank inside for your own message and come with an envelope.